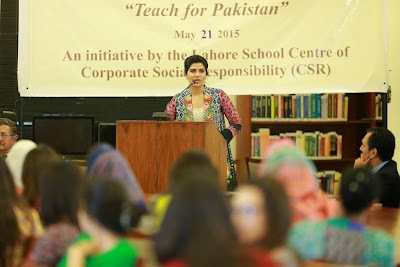 The Lahore School of Economics Corporate Social Responsibility Centre signed Memorandum of Understanding (MOU) with “Teach For Pakistan” on May 21, 2015 at the Lahore School’s main campus in the presence of faculty, students and fellows from “Teach for Pakistan.” The Lahore School agreed to adopt an under resourced school in its surrounding area. Dr Shahid Amjad Chauudhry, the Rector Lahore School of Economics emphasized the importance of taking up its CSR Centre to an entire new dimension. He also commended the Lahore School’s CSR initiative in the health sector and encouraged the involvement of students and faculty for the betterment of society. Ms Mahlaqa Shaukat (City Manager TFP), adding to the discussion, said that this was their first partnership with an educational institution. 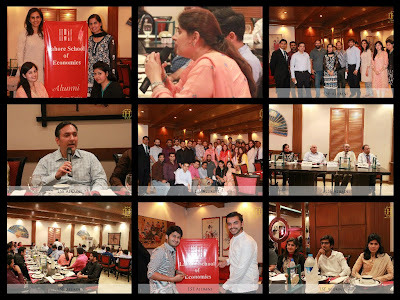 The second Lahore School Alumni get together for the current year was held on May 16, 2015 at Yum Restaurant. Alumni from 1996-2015 who are either working in an entrepreneurial capacities or in society development positions attended. 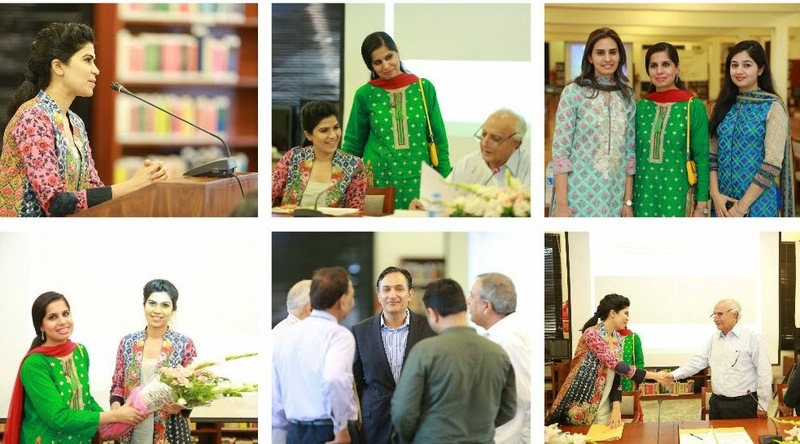 Senior faculty including Dr Shahid Amjad Chaudhry, Dr Sohail Zafar, Dr Azam Chaudhry, Dr Shehla Arifeen, Ms. Shumyla Chaudhry, Professor Fareedy and Ms. Naila Hafeez were also present. Dr Shahid Amjad Chaudhry, Rector of Lahore School, introduced the newly setup societies which includes the CSR (Corporate Social Responsibility) and BDC (Business Development Centre). The Rector also discussed ways to improve Alumni and Lahore school management liaison. The Alumni made various suggestions to assist the Lahore School in terms of the new projects on CSR and BDC. The second Free Medical Health Camp was setup by the Corporate Social Responsibility (CSR) on May 15, 2015 at Shareef Hospital. The capacity to provide consultancy to patients was increased by 43% for the second camp as compared to the first camp. 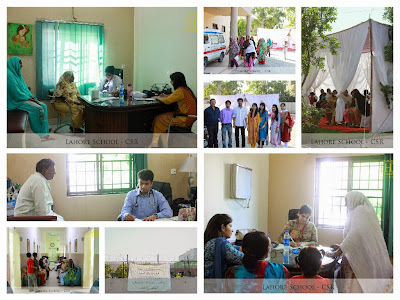 Dr Baqar Shareef (General Physician, Shareef Medical Hospital), Dr Umme-Rubab (Consultant Hospitalist, Shaukat Khanum) and Dr Shireen Gul (Consultant Gynecologist, Ganga Raam Hospital) provided medical consultancy to the patients. A total of 186 patients were treated for ailments ranging from basic muscular spasm to acute gastro-intestinal disorders. Majority (70 %) of the patients treated were females and children. Seven student volunteers along with the CSR team managed the medical camp. In an extremely important and relevant article published in the Lahore Journal of Economics, Naheed Memon, Faiza Rehman and Fazal Rabbi looked at the implications of trade liberalization with China and India. The article was titled, “Should Pakistan Liberalize Trade With India Against the Backdrop of the FTA with China? A Comparative Advantage Analysis for the Manufacturing Sector,” and in the article the authors looked at the impact of the liberalized trade regime between Pakistan and China and the proposed liberalization in trade between Pakistan and India. The authors investigated the benefits of trade liberalization between the two countries by studying the global competitiveness of Pakistan’s industrial sector from a policy perspective. To do this, the authors looked at construct a revealed comparative advantage index for manufacturing products (HS 2-digit level) for Pakistan, India, and China for the period 2003–12, and then identified the changing patterns of comparative advantage for Pakistan. In a fascinating article published in the Lahore Journal of Economics, Dr. Matthew McCartney (of Oxford University) performed a unique historical analysis of the Pakistani textile sector. In the article entitled ‘The Political Economy of Industrial Policy: A Comparative Study of the Textiles Industry in Pakistan’, Dr. McCartney analyzed why the textiles industry in Pakistan has failed to fulfill its “historical mission,” whether judged in terms of promoting rapid and sustained economic growth, reducing poverty, or providing employment to young women and so promoting wider social transformation. Dr. McCartney makes a case for a particular and targeted form of industrial policy that would help the textiles sector learn and upgrade. In a fascinating paper by Asma Khalid (from the State Bank of Pakistan) titled ‘Pakistan’s Parallel Foreign Exchange Market’ published by the Lahore Journal of Economics, we get a unique look at the structure of the parallel foreign exchange market in Pakistan. The paper gives a comprehensive picture of the structure and evolution of this market in Pakistan. The author starts with a brief historical perspective, which flags the importance of workers’ remittances to the country and explains how the bulk of this inflow is transacted through the hundi/hawala network (informal money changers). Exporters in Pakistan and Firms Who Do Not Export: What’s the Big Difference? 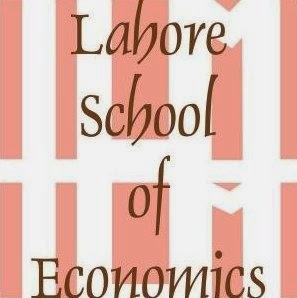 In a recent paper published in the Lahore Journal of Economics titled ‘Exporters in Pakistan and Firms Who Do Not Export: What’s the Big Difference?’ Dr. Theresa Chaudhry (of the Lahore School of Economics) and Muhammad Haseeb took a novel look at the critical issue of Pakistani exports. The authors used two cross-sections of firm-level data — the Census of Manufacturing Industries (CMI) 2000/01 for Punjab and the World Bank Enterprise Survey data set (2006/07) for all Pakistan to look at the characteristics of exporting firms. The authors found similar levels of export market participation but very large shares of export sales in firm revenue for those who do, compared to the US sample. The authors also found, as do many other studies, that exporters exhibited significantly higher total factor productivity (TFP) and are larger in terms of employment than non-exporters. Considering the eight largest sectors (which comprise more than 80 percent of the CMI Punjab), with a few exceptions, exporters had higher labor productivity and offered higher compensation to workers, but used more capital per worker and more imported inputs. 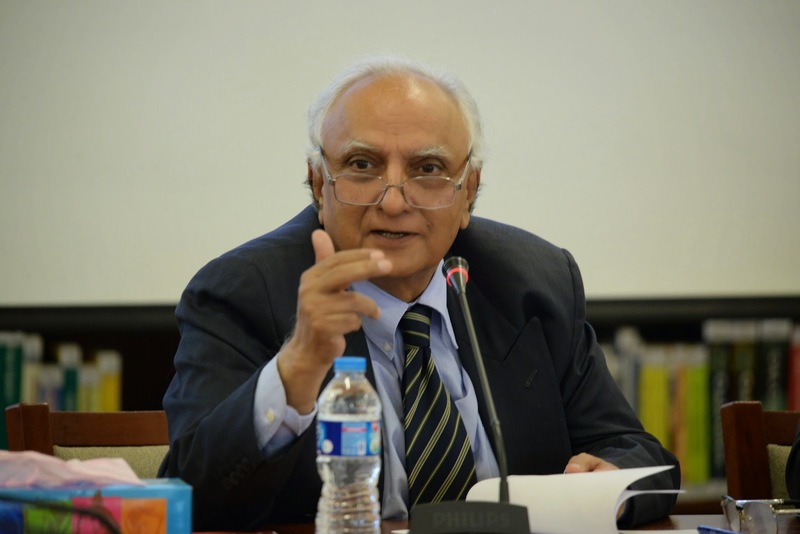 In an insightful article published in the Lahore Journal of Economics by Dr. Rashid Amjad entitled, ‘Pakistan’s Growth Spurts and Reversals: A Historical Perspective, the author looks at the cyclical pattern of growth in Pakistan, Dr. Amjad takes a historical perspective to search for the major causes of Pakistan’s stop go growth cycles. Dr. Amjad comes to the conclusion that, to varying degrees, the foreign exchange constraint provides a major explanation for these cycles of irregular economic growth in the country, particularly since the 1990s. First, countries that have managed to increase their exports focused on doing so in sectors in which they had expertise while slowly developing new export sectors at the same time. Lahore School of Economics Team bagged the Basketball trophy in LUMS Basketball National Championship 2015 held from 30 April to 3 May 2015 at LUMS. Universities from all over the country participated in the Championship. 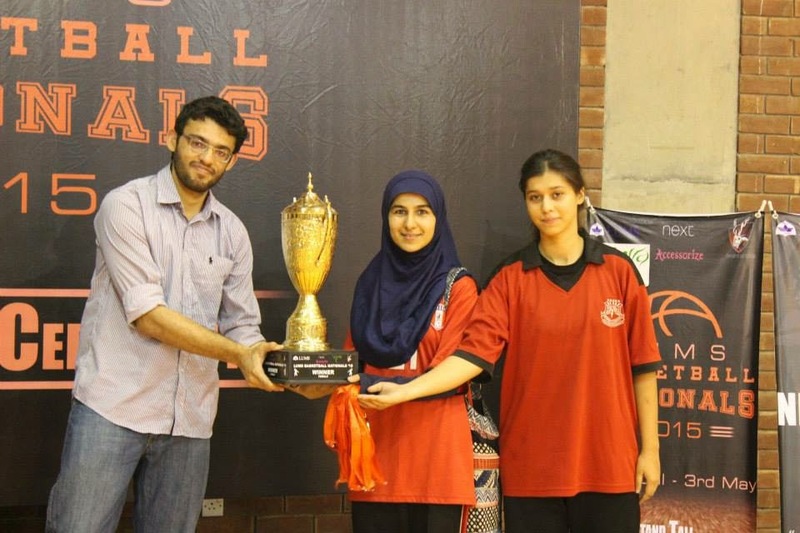 Lahore School team comprised Zinat, Miahn Ghalib, Ayesha, Zainab and Hafza. 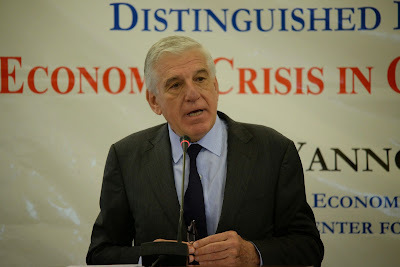 “In Greece the GDP fell by 25% in five years, unemployment reached 28% while public debt as percent of GDP rose to 175% reflecting mainly the collapse of output,” according to Dr. Yannos Papantoniou in a lecture delivered at the Lahore School of Economics May 5, 2015. Dr. Papantiniou, Former Economy and Finance Minister of Greece (1994-2001) and President of the Centre for Progressive Policy Research, in his lecture “Economic Crisis in Greece and the Future of the Euro” was of the view that if talks between the lenders (ECB, IMF, and the EU) and Greece stall, Greece’s economy would sink further into recession, and social tensions would rise as living standards would register a further sharp decline. He emphasized that Greece’s economic problems did not arise during the process of acceding to the euro area, but began when large current imbalances emerged among member countries soon after the currency union’s creation in 2000. Massive current account deficits in the weaker economies led to the accumulation of public and private debt while the northern Europeans were running surpluses.The policies that the eurozone has initiated to tackle the debt crisis have been inadequate and even self-defeating.